When it started its journey back in 1938, baseball fans could hardly have imagined that a grey flannel made for Lou Gehrig would some day sell at auction in excess of $200,000. Since 1938, that same garment has likely passed through the hands of Gehrig, Yankee clubhouse men, at least four auction houses and a handful of wealthy collectors. There was no photo match and Gehrig never wore the offered jersey in the 1938 World Series, as REA claimed. REA had also claimed that the jersey could have been the last one ever worn by Gehrig in a World Series during games three and four at Chicago. However, games three and four of the 1938 World Series were played at Yankee Stadium and Gehrig would have worn pinstripes in his last Series games. Grob wrote a follow-up article describing the ins-and-outs of imagery analysis and the pitfalls of claiming “photo matches,” while REA followed up with their own claim of yet another new ”photo match” alleging that Gehrig is wearing the same jersey in spring training. Now that the arguments about the Gehrig flannel have been laid to rest, judgement on this jersey lies in the hands of the collectors willing to pay for it. In consideration of the attempts made to authenticate and ”photo match” this garment, we thought we’d also point out the past history and provenance of the jersey, including some information the auction house doesn’t reference in their lot description. 1938- The Gehrig jersey’s journey begins when its delivered to the Yankees sometime before or during the 1938 American League campaign. 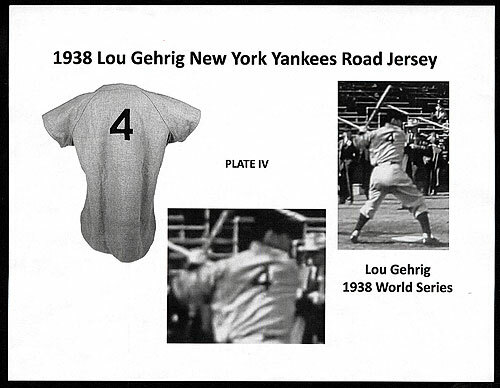 REA claimed that Lou Gehrig was wearing this jersey in the World Series during October, but authenticator Dave Grob, refuted this claim stating Gehrig could have worn this jersey and others sometime during the 1938 season. REA claimed the number “4″ on the back of the jersey was distinctive to 1938, but Grob showed that the font of the Yankee number “4″ during those years was found on jerseys from several years of play. Grob believes all he can truthfully say is that the jersey is authentic and that Gehrig likely wore the jersey sometime during the 1938 season. 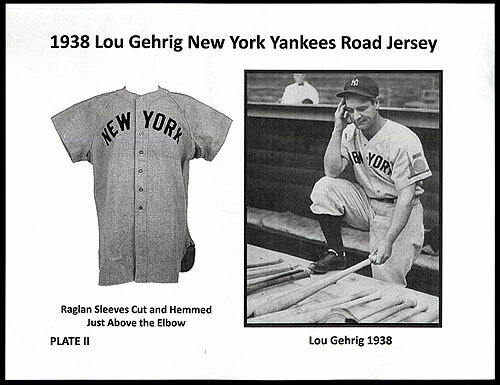 Hauls of Shame found photos of Gehrig wearing three different road jerseys during 1938 and one of them, from April of 1938, appears as if it could be the jersey being offered at REA. REA claims to have a photo match of Gehrig in this jersey, but that photo is nowhere to be found. Mark Friedland poses with his 1991 auction prize, the 1938 Gehrig road jersey. His purchase for $220,000 was considered a world-record at the time. The 1938 Gehrig jersey was offered in San Francisco at auction with an estimate of $150,000-$175,000. 1994- The 1938 Gehrig jersey was featured in a New York Daily News special report on fraud in the memorabilia industry written by Bill Madden. 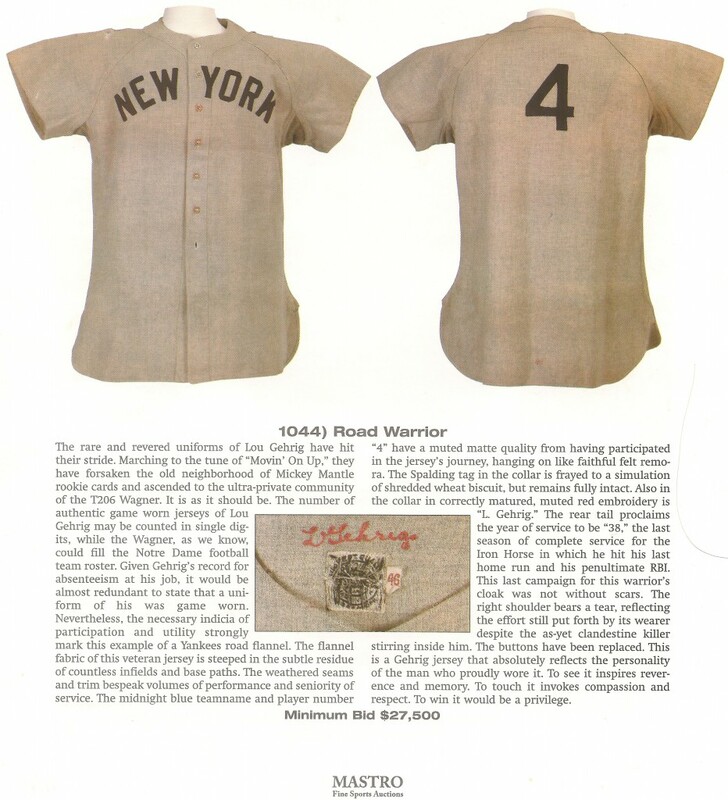 The 1938 Gehrig jersey was pictured in the article along with forgeries and questioned items sold by Richard Wolfers Auctions and Sports Heroes Inc. 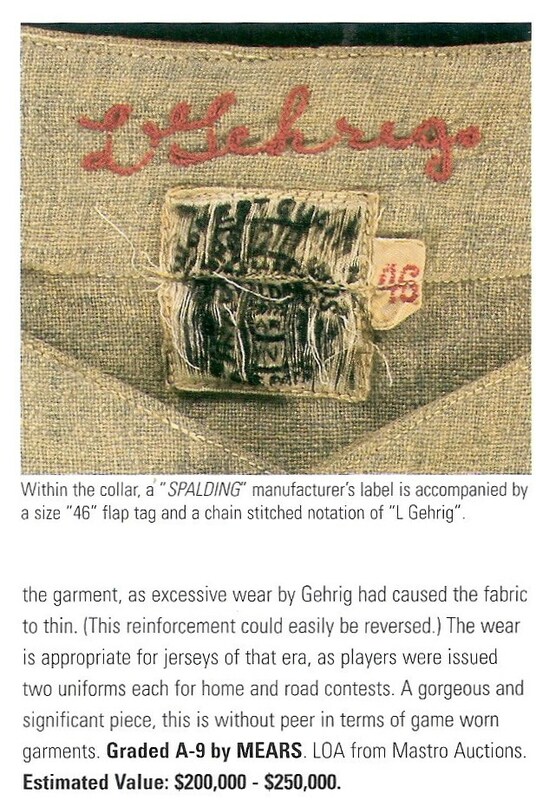 In the report, Madden also recounts the history of what he calls a “1937 road uniform” of Gehrig and its owners, including, Andy Imperato, of Grey Flannel, Barry Halper and New Jersey opthalmologist Richard Angrist. Madden’s report from May of 1994 implicated Wolfers Auctions’ principal Duane Garrett for selling bogus uniforms and autographed baseball gloves. On July 26, 1995, Garrett committed suicide by jumping off the Golden Gate Bridge in San Francisco. 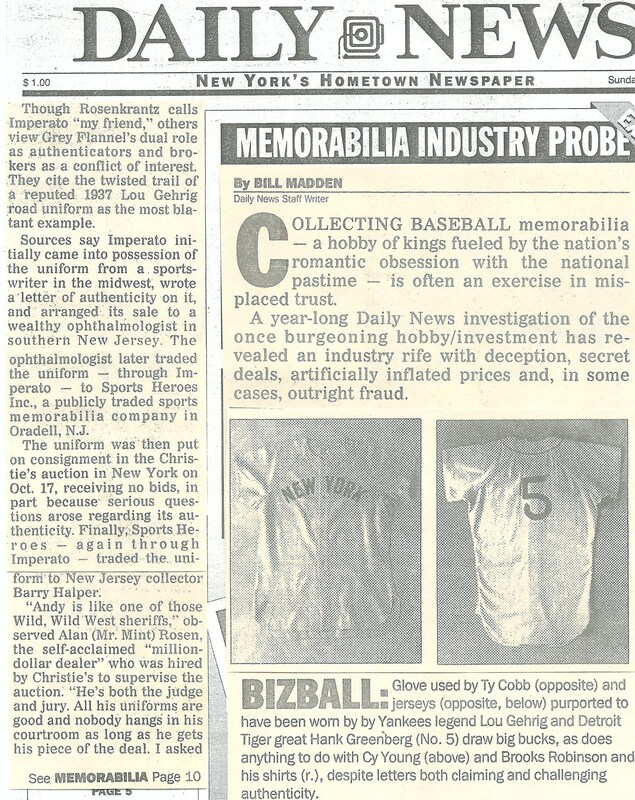 This 1994 Daily News special report on fraud in the memorabilia industry featured the 1938 Gehrig jersey and questioned its authenticity. 1999- The 1938 Gehrig jersey was offered for sale in Chicago by Mastro Fine Sports Auctions. 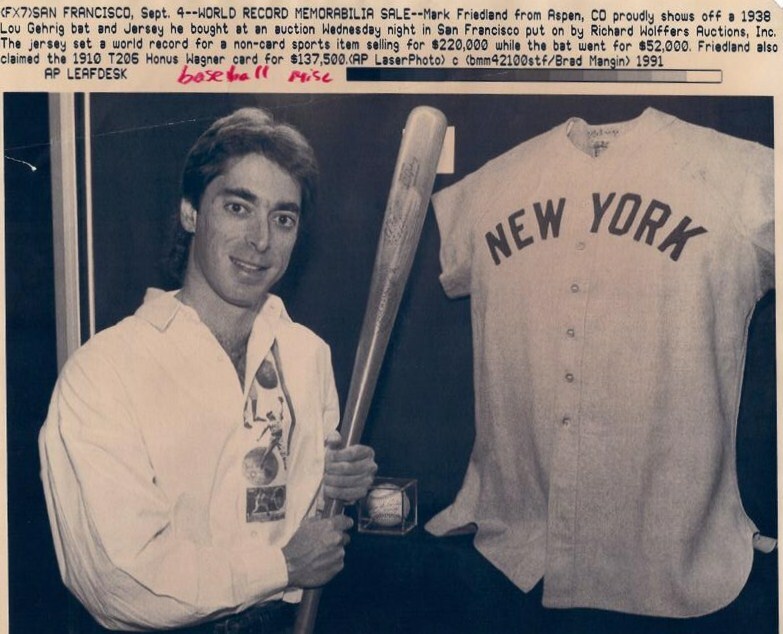 The auction house noted a tear on the jerseys shoulder and mentioned that ”The buttons have been replaced.” New York dealer John Brigandi wins the jersey for a price of $60,486, a far cry from its sale price of $220.000 in 1991. Collectors we interviewed believe the jersey’s ties to Duane Garrett, Wolfers Auctions and Sports Heroes Inc. contributed to the jersey’s poor showing at auction. A decade after it was sold in San Francisco, the 1938 Gehrig jersey is sold in Chicago by Mastro Fine Sports. 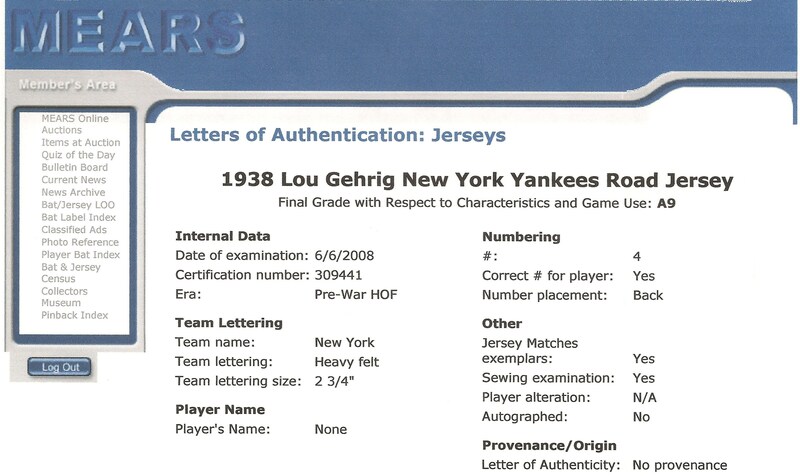 2008- Mastro Auctions offered the 1938 Gehrig road jersey again as lot 1044 in their August sale. They noted, “the jersey has undergone professional reinforcement within the shoulders.” The description also states that there were no “remnants or stitching from a (Worlds Fair) patch.” The jersey was graded “A-9″ by MEARS. The jersey sold for $240,000. Mastro Auctions offered the 1938 Gehrig jersey for the second time in 2008. The lot description includes the MEARS evaluation of A-9 (top) and notes considerable conservation work done to the shoulder area of the garment. 2011- The purchaser of the Gehrig jersey in the 2008 Mastro auction consigns it to REA. 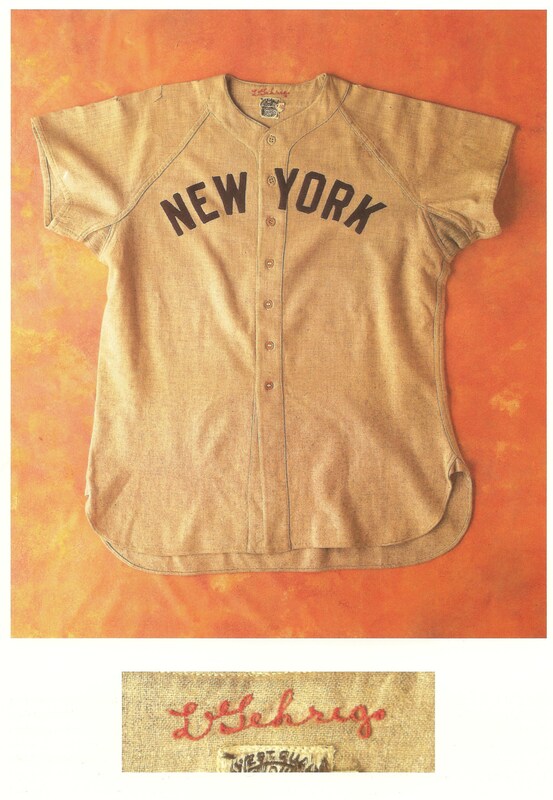 The auction house is currently offering the 1938 Gehrig road jersey as lot 7 in their annual spring sale. The current bid on the jersey is $85,000. Bidding on the jersey will have to be brisk in order to reach the level of the 1991 and 2008 sales, which exceeded $200,000. Bidding for the Gehrig jersey ends on May 7th. 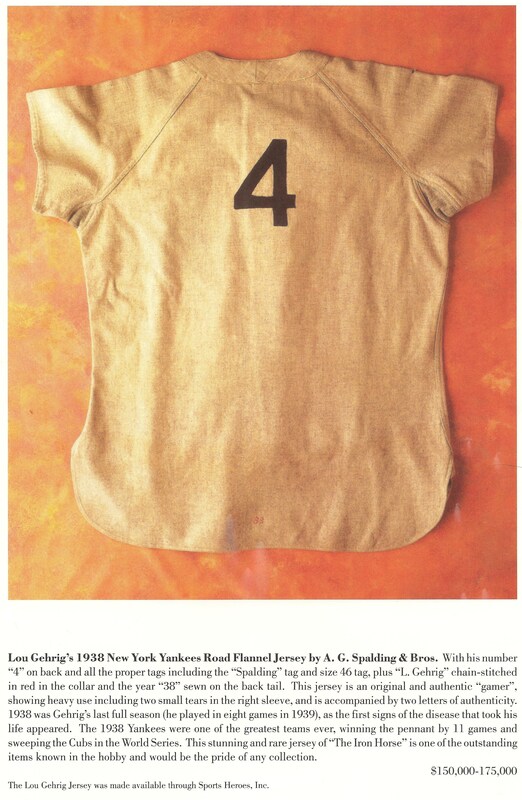 REA's current Gehrig jersey as it appeared in the 1991 catalogue of Richard Wolfers Auctions and sold for $220,000. What is interesting is that in the original listing with Wolfers, the description mentions two letters of authenticity, which I am assuing is the provenance, yet in the MEARS letter, they say there is no provenance. I suppose they don’t want to mention Wolfers, and what happened to the original two LOAs? I don’t think MEARS was ever presented with the original two LOA’s that originally came with the jersey when it was first purchased in 1991.
quite the journey for that jersey. The article you linked about the suicide of the wolfers auctions president and his dealings (or non-dealings) with barry halper was pretty interesting. Wonder if therels more to that story.